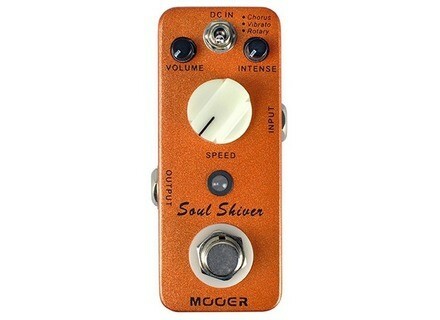 Soul Shiver, Multi-effect or other modulation effect from Mooer in the Micro series. The Uni-Vibe is definitely a must-have this year and Mooer did not miss the event with their Micro version of this legendary effect. Just like on the original Uni-Vibe, the Mooer Soul Shiver offers two Chorus and Vibrato effects. The first provides a wider spatialization of the sound and is more complex than a simple vibrato, and the second sounds more like a pitch bender with a touch of phaser. You can use it to add depth to the sound. A third Rotary effect is also available. It combines the first to effects to simulate a Leslie cab. Joe Satriani signs his first single coil pickup DiMarzio and Joe Satriani worked for two years on the first “Satch’s” Signature single coil pickup for guitar. Paul Masvidal signs a Pro Tone chorus pedal Pro Tone Pedals and Cynic guitar player Paul Masvidal recreated the chorus sound heard on Traced in Air and Focus albums. TC Electronic updates Trinity and Alter Ego TC Electronic introduces new versions of its Alter Ego Vintage Echo and Trinity effect pedals, the latter has been renamed to T2 for the occasion.